Scorpion bites are common in our country, particularly in the rural areas. Among 86 species of scorpions present in India, Mesobuthus tumulus (Indian red scorpion) and Heterometrus swammerdami are of medical importance. Though local symptoms including severe pain and burning sensation at the site of sting are the most common manifestations, systemic complications can ensue. Cardiovascular manifestations are particularly prominent following stings by Indian red scorpion. Such bites infrequently have serious clinical sequelae, including myocardial infarction, acute pulmonary edema, cardiogenic shock and even death. We present herein a case report with the clinical manifestations following scorpion bite mimicking acute myocardial infarction (AMI). A 35-year-old lady presented in the Emergency Department with complaints of breathlessness and chest pain associated with cold sweating since half an hour after being stung on her right middle finger by a red scorpion. Her past history was not significant and she had no predisposing cardiac risk factors. On examination, her blood pressure was 154/84 mmHg, heart rate 130/ min, regular and respiratory rate 36/min. There was an audible S 3 with bilateral diffuse inspiratory basal crepts. Jugular venous pressure was raised. Serum cardiac enzymes were increased, and the level of creatine phosphokinase (CPK)-MB was 45 U/l and that of troponin-I was 0.06 ng/ml. 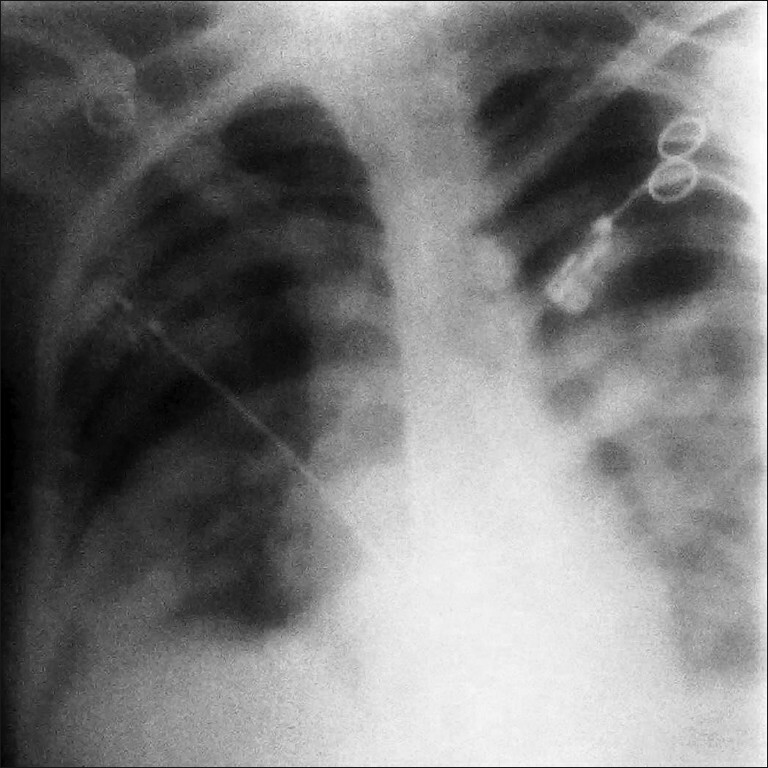 Chest skiagram revealed pulmonary edema [Figure 1]. Electrocardiogram [Figure 2]a showed sinus tachycardia with secondary "ST-T" changes. 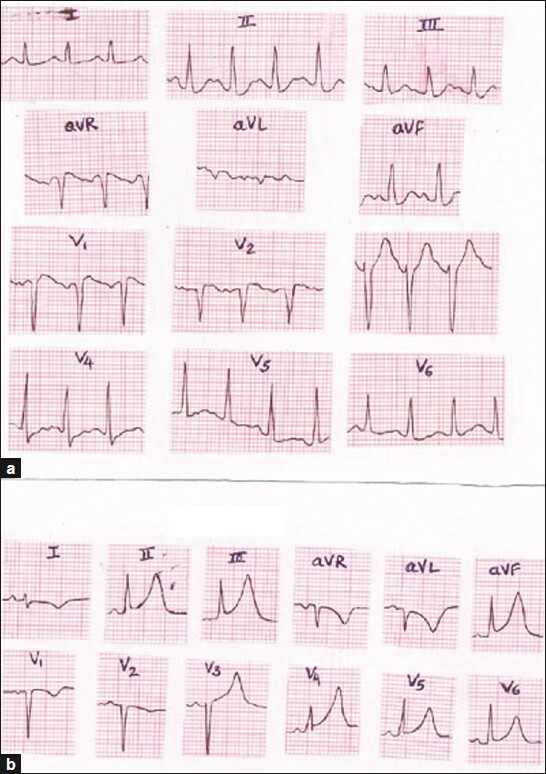 However, subsequent ECG on the next day [Figure 2]b revealed normal sinus rhythm with "T"-wave inversions in leads I, aVL, V 1 and V 2 , and ST segment elevation with concavity upward in leads II, III, aVF and V 5 , and V 6 . Echocardiogram demonstrated hypokinesia of interventricular septum and inferior posterior wall with moderate mitral and tricuspid regurgitation and left ventricular ejection fraction (LVEF) 28% [Figure 3]a and b. 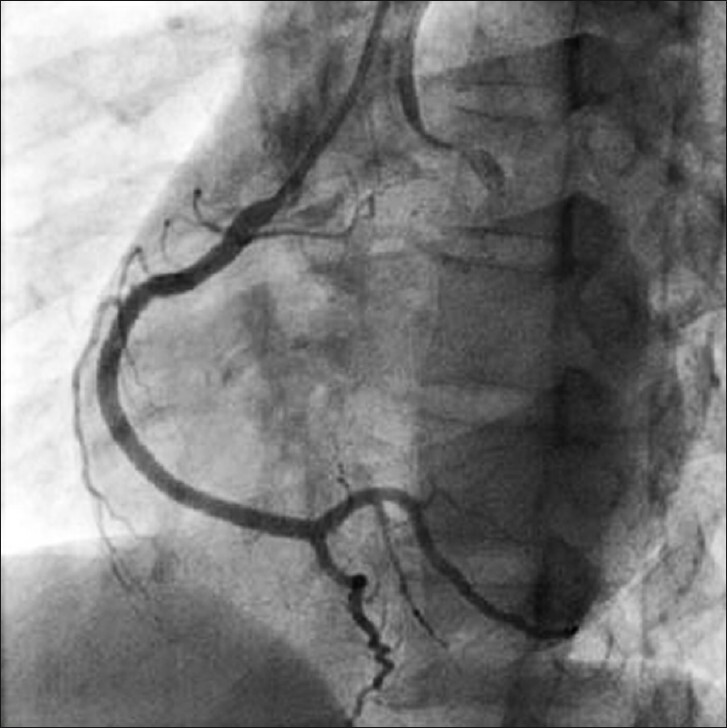 Finally, coronary angiogram was performed which revealed normal coronary vessels [Figure 4] and [Figure 5] with positive ergonovine and acetylcholine challenge test for coronary artery vasospasm. She undertook medications including antiplatelet drug and low-dose beta blockers. Her admission course was smooth and she was discharged uneventfully 5 days later. Follow-up ECG taken about 1 month later revealed only symmetric T-wave inversion in leads II, III, aVF and V 2-6 , and echocardiogram showed no regional wall motion abnormality, with well-preserved LVEF. Anaphylactic reaction: Release of allergenic proteins causes anaphylactic shock leading to hypotension with vasodilation and decreased of intravascular volume with reduced myocardial perfusion. In our patient, the findings mimicked AMI (including clinical symptoms, dynamic changes of ECG, elevated cardiac enzymes and regional wall motion abnormality). Probably, coronary vasospasm compounded with the above-mentioned sequences (myocarditis, pulmonary edema) has precipitated AMI in our case. AMI occurs very rarely after an arthropod envenomization. There are a few cases of AMI due to bee or scorpion bites reported in the literature. , Hence, it is worth reporting this rare entity. 1. Erfati P. Epidemiology, symptomatolgy and treatment of buthinae stings. In: Bettini S, editor. Arthropod Venoms: Hand book of experimental Pharmacology. New York: Spring Verlag; 1978. p. 312-5. 2. Bawaskar HS, Bawaskar PH. Scorpion sting. J Assoc Physicians India 1998;46:388-92. 3. Bawaskar HS, Bawaskar PH. Indian red scorpion envenoming. Indian J Pediatr1998;65:383-91. 4. Yang HP, Chen FC, Chen CC, Shen TY, Wu SP, Tseng YZ. Manifestations mimicking acute myocardial infarction after Honeybee Sting. Acta Cardiol Sin 2009;25:31-5. 5. Rahav G, Weiss T. Scorpion sting induced pulmonary edema. Scintigraphic evidence of cardiac dysfunction. Chest 1990;97:1478-80. 6. Bawaskar HS, Bawaskar PH. Management of scorpion sting. Heart 1999;82:253-4. 7. Levine HD. 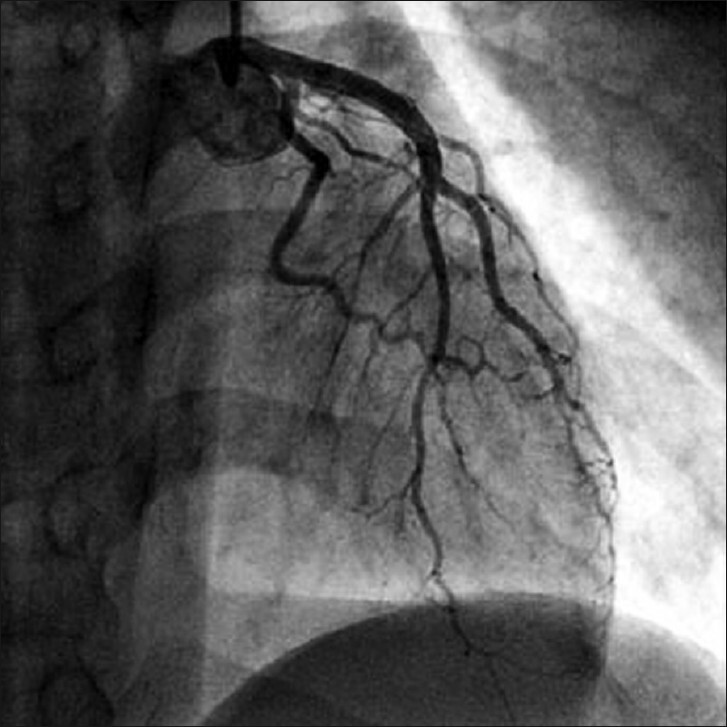 Acute myocardial infarction following wasp sting. Report of two cases and critical survey of the literature. Am Heart J 1976;91:365-74. 8. Wagdi P, Mehan VK, Burgi H, Salzmann C. Acute myocardial infarction after wasp stings in a patient with normal coronary arteries. Am Heart J 1994;128:820-3.